PPG announced that it received three 2018 Chairman’s Awards – including the top honor – from the Metal Construction Association (MCA) during the organization’s winter meeting in Key Largo, Florida. PPG was the only coatings manufacturer recognized with awards. PPG received the highest honor for the Emma and Georgina Bloomberg Center at Cornell Tech, which earned the Chairman’s Award for Overall Excellence. Located on New York City’s Roosevelt Island, the building features a metal-panel rainscreen finished with iridescent PPG Duranar VARI-COOL coatings. The rainscreen serves as a protective insulating barrier as well as a color-shifting wall of art for the 160,000-square-foot structure. Fabricated by A. Zahner Company of Kansas City, Missouri, using the company’s proprietary louvered ZIRA system, the rainscreen features more than 335,000 perforated circular tabs, with each programmed to function as an individual pixel. Together with PPG Duranar VARI-Cool coatings, the tabs enable the rainscreen to depict the New York City skyline and the gorges of Ithaca, New York, which is home to Cornell University’s main campus. For more information, visit www.ppgmetalcoatings.com and www.ppg.com. The SmartCut BKCR404 glove is designed with high-molecular-weight polyethylene fiber thread blend to ensure dexterity and tactile sensitivity. When the job calls for cut protection, slip-resistance, and surface protection, the Brass Knuckle SmartCut BKCR404 is the glove to use. 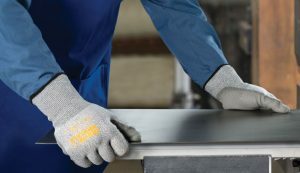 This glove is ideal for handling finer-surfaces and finished goods, like glass, polished metals, painted or powder coat surfaces, ceramics and more. BKCR404 is designed with high-molecular-weight polyethylene fiber thread blend to ensure dexterity and tactile sensitivity. This HDPE knit fiber provides ANSI cut level 4 protection without bulk. The polyurethane coating over palms and fingers is pliable, enhancing dry grip. When compared to nitrile and latex coatings, polyurethane offers a high level of dexterity and improves ergonomics. The coating on the BKCR404 leaves minimal marking (residue)—even on glass, metal or other fine finishes. The BKCR404 is approved by PPG on its low emissivity (or low-e glass coated) products due to minimal marking and easy clean up. Fit is a part of comfort, affecting both productivity and wearer compliance. These gloves reflect Brass Knuckle’s fit, form and function development methodology, wherein stitching, yarn combinations and coatings each account for the natural curvature of the hand and flex points. PPG Industries’ coil and building products coatings group announced that its Architectural Metal Coatings binder is now available online in a digital, downloadable format. The digital binder features fully updated catalogs, product brochures and data sheets for PPG’s entire roster of PPG liquid coil coatings such as DURANAR and CORAFLON fluoropolymer and DURASTAR polyester coatings, and liquid and powder extrusion coatings such as Duranar and Coraflon fluoropolymer and ENVIROCRON polyester coatings. The binder also contains PPG color guides, technical documents, white papers and case studies, along with sourcing information for PPG CAP CERTIFIED APPLICATOR PROGRAM group participants and PPG-approved extrusion applicators and coil coaters. Sharon Bird, PPG marketing communications manager, industrial coatings, said that the new digital binder demonstrates PPG’s commitment to “green” building and design, and it will complement PPG’s growing array of online tools, including a newly enhanced searchable project gallery. “PPG is committed to sustainable business practices. This new digital binder shows that commitment while giving architects, specifiers, coaters and applicators access to the latest product information from PPG, even when they are on the go,” she said. Visit www.ppgideascapes.com to preview the digital PPG Architectural Metal Coatings Binder or call (888) PPG-IDEA (774-4332) for more information about PPG coil and building products coatings. PPG Industries‘ coil and building products coatings group announced that it will reintroduce DURANAR ADS (air-dried system) fluoropolymer coatings this summer, three years after the products were withdrawn from the market. This next-generation line of Duranar ADS coatings, based on a newly-formulated fluorinated copolymer resin combined with PPG proprietary chemistry, is designed to repair fluoropolymer coatings on architectural metals damaged during production or after field installation. In addition, these high-performance coatings can provide a wide range of color options for manufacturers and contractors in solid, metallic, pearlescent and infrared-reflective (IR-reflective) pigment technologies. Brian Knapp, PPG manager, coil and building products coatings, said the reformulated products will fill a specific demand that has been unmet since first-generation Duranar ADS coatings were discontinued. “Other than acrylic lacquers, which are not very durable, there has not been a user-friendly product available for touching up fluoropolymer coatings on products such as window frames, door frames, roofs and metal wall panels marred during fabrication or installation,” he explained. Because of its single-component formulation, Duranar ADS coating has the flexibility to be applied by fingernail brush for small touch-ups at the end of a production line or to be spray-applied in the field to repair or refurbish weathered metal roofing or siding panels.